FILE -Taliban leader Mullah Omar. The Taliban has formally confirmed the death of the group's founder, Mullah Omar. An Islamist movement statement Thursday says Omar died of illness, but gave no details of when or where, saying only his health deteriorated over the last 15 days of his life. The announcement sheds no new light on whether a statement Wednesday from the Afghan government is correct in saying Omar died two years ago. But the Taliban says Omar did not leave Afghanistan at any time since U.S.-backed forces overthrew the group in 2001, despite the Afghan assertion he died in a hospital in Pakistan. A Pakistani statement earlier Thursday said the next round of Afghan peace talks have been postponed at the request of the Afghan Taliban leadership. Pakistan which hosts the talks said it remains hopeful the Taliban leadership will stay engaged in the peace process. An emailed Taliban statement suggested the group did not support participating in the peace talks. The Afghan foreign ministry said it "is committed to the peace negotiations" with the Taliban and urges their resumption in the near future. 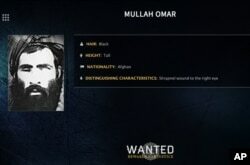 FILE - In this undated image released by the FBI, Mullah Omar is seen in a wanted poster. An Afghan official said his government is examining claims that reclusive Taliban leader Mullah Omar is dead. Mullah Akhtar Mansoor, the head of the Taliban's political and military affairs, has been chosen as the insurgent group's leader, according to media reports that cited senior Taliban officials. But the group has not confirmed the appointment. Afghan government officials say Mullah Omar died in 2013 in Pakistan. "He was very sick in a Karachi hospital and died suspiciously there," Abdul Hassib Seddiqi, the spokesman for Afghanistan's main intelligence agency, the National Directorate of Security, said. He did not explain what was suspicious about the death, or say how long his agency had possessed information about Omar's fate. President Ashraf Ghani's office also said Omar died in 2013. In Washington, the White House said the reports of Omar's death appeared credible and U.S. intelligence authorities are looking into the circumstances of his death. Mullah Omar had made no public appearances nor presented direct evidence he is alive for at least five years. Previous reports of his death that appeared in news media in the region never gained wide circulation. The most recent Taliban message said to be from Mullah Omar, distributed earlier this month, endorsed the Afghan peace talks as “legitimate” in terms of Islamic principles. Omar was quoted as saying he would not oppose peaceful negotiations if they could help end “U.S.-led foreign occupation” of Afghanistan and establish an Islamic system of government in the country. In a screen grab from a video released by the Office of the Director of National Intelligence (ODNI) on May 20, 2015, Osama Bin Laden rehearses a speech as he appears in a video document linked to "Bin Laden's Bookshelf," a package of declassified material. Mullah Omar led the Taliban when U.S. forces invaded Afghanistan in 2001 after the September 11 terrorist attacks against the United States. The Taliban supported al-Qaida and sheltered its leader at the time, Osama bin Laden, who took credit for planning the attack by hijacked airliners that killed nearly 3,000 people in the U.S. In the aftermath of the 2001 attacks the U.S. government offered large rewards for the capture of many al-Qaida and Taliban leaders. A $10 million bounty was offered for Mullah Omar. Omar had been the supreme commander and spiritual leader of Afghanistan since 1996. After fleeing into Pakistan, he dropped out of sight after the U.S. invasion that followed the 2001 attacks on New York and Washington.